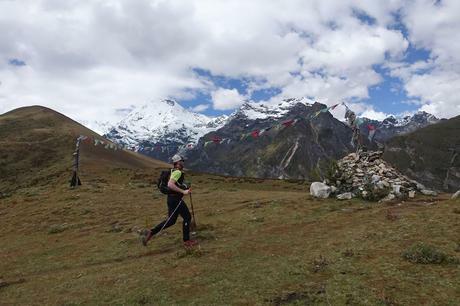 Way back in 2016 we followed along as a team of ultrarunners made an attempt on the Snowman Trek in Bhutan. The Snowman is one of the hardest, most demanding trails in the world, and the team of Ben Clark, Anna Frost, Tim Olson, and Chris Ord set out to run it end-to-end in less than 14 days. Along the way, they faced a bevy of challenges, including porters and logistical support that quit on them, poor weather conditions, and incredibly difficult terrain. Yet in the end, they were able to accomplish their goal. Fast forward to today, and National Geographic has posted an inside look at the expedition, sharing some behind the scenes details of just what it took for the team to make this daring and difficult journey. The article is an interview with mountaineer, endurance athlete, and filmmaker Clark, who still has a lot to tell about the Snowman Trek adventure. In the interview, he talks about the origins and idea of attempting a speed record on the Bhutanese trail, what inspires him to visit remote corners of the globe, and why he chose this particular adventure. He also talks about the team's preparation for the speed-record attempt, how he selected those that came along with him, and some of the challenges that they faced along the way. Clark made an amazing documentary about the speed-record attempt and it will be debuting in 350 movie theaters across the U.S. on May 17 at 7:00 PM local time. It is a one time showing of the film, and tickets can be purchased online.